According to a 2010 Rand Corporation Study, a redirection of non-urgent emergency department visits could save approximately $4.4 billion annually. Emergency room visits are rising: for the ten years from 1996-2006 visits were up 36%, reported in the 2014 American College of Emergency Physicians Polling Survey Results. 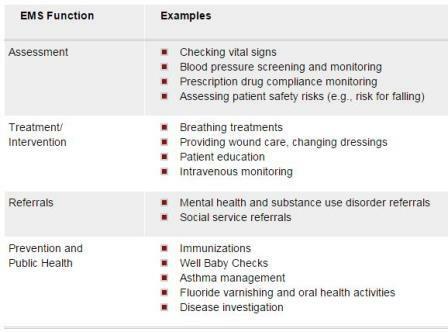 According to the 2012 National Conference of State Legislatures report, “Beyond 911: State and Community Strategies for Expanding The Primary Care Role of First Responders,” the three main drivers of emergency department and emergency medical services misuse are lack of access to primary care providers and services, chronic illness and medical severity, and homelessness. So what is community paramedicine? Paramedics with this additional training (EMT-P designation) operate under strict standards and procedures with clear medical control by a supervising physician as they respond to emergency situations and provide some medical transportation roles in the communities they serve. Community paramedics are experienced paramedics with additional training in patient assessment and familiarization with healthcare providers and social services that are available to the community they serve. The net result is a more direct, integrated and immediate approach to healthcare delivery in a community. How does this impact insurance and benefits? Financing of community paramedicine services faces many hurdles, but there are several bright spots across the country and on the federal level. Several states (Minnesota, Maine, and Colorado) have passed legislation to allow reimbursement for these services under insurance plans. On the federal level, Medicaid doesn’t currently recognize community paramedic services for reimbursement, but alignment to value-based medicine and a patient centered medical home model may allow for alignment of these services in the future. If the states and federal government can come into alignment and allow reimbursement for community paramedicine services, insurance companies will align policies to allow this service. If provider organizations adopt community paramedicine as part of a commitment to value-based medicine and patient-centered medical homes, they will be able to provide more direct, local care, in a timely fashion at a lower cost. With 10,000 baby boomers turning 65 every day and millions of previously uninsured joining the insured ranks, primary care is a focus in the provision of health care now and for many years to come. Community paramedicine is a primary care force multiplier that makes sense.